No time to panic here, first find out where we are at and then determine our options. Getting the GPS and our map, we determined that we were about three or four miles east of Little Yosemite Valley and the Merced River. It was hard to tell how far we were from the actual fire at this point, but knew that it was generally to our east around Babcock or Merced Lake. Our options were limited because the other paths out were both uphill which would slow us down. We just descended 800 ft. and there sure was a lot of timber fuel back there. Our only real choice was to head west. We picked up the pace when the first chopper flew in front of us – about 1/2 mile or so. It had a bucket hanging underneath. Well, at least the calvary was arriving. As we came across a saddle, we saw a horrifying sight. The fire was crossing a canyon to our left and climbing the mountain. Was it moving east or south? It was hard to tell. At this point, we kept going but discussed what we would do if we were boxed in by fire. One option was to find rocky terrain or a meadow with little or no fuel. Another was to find a creek or body of water, but the nearest was the Merced River. 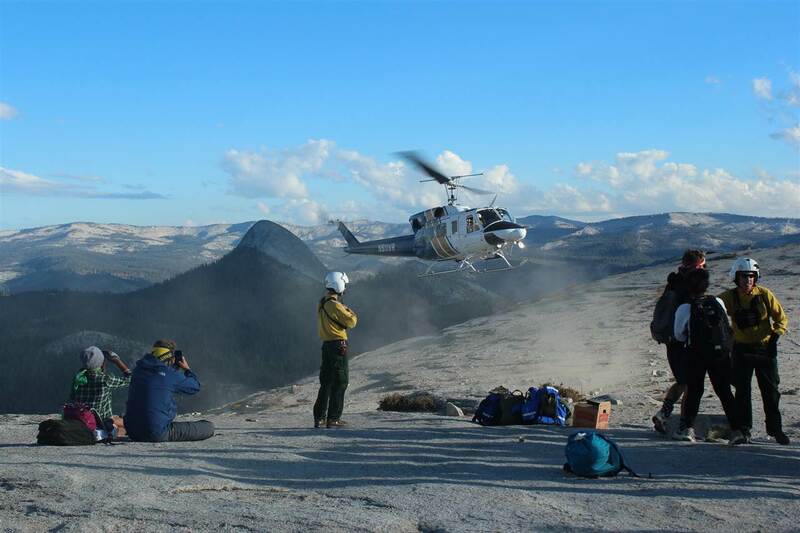 Helicopter rescue on Half Dome, Sep 2014. Photo credit AP. We were around 30-40 minutest from the rally point. Would they evacuate us from there? We kept pushing and noticed that smoke was starting to appear in front of us. Up ahead there was a clearing with a person. As we got closer it became apparent that it was two people. One was laying down and the other was frantically waving at us. It was a woman waving and a guy was laying down. I asked what happened and she said they were running when he collapsed. I checked for a pulse and breathing and found both. He seemed to have passed out, but it was hard to tell if he had suffered a heart attack. He started to come around and we propped his head up on the pack. He was delirious and then I noticed that he wasn’t sweating. I asked the woman if she had any water to give him and she told me they ran out about an hour ago. At this point I guessed that he was suffering from heat exhaustion or heat stroke. I gave him a small amount of water and moved him into the shade of a big lodgepole pine. I told my wife and brother to continue on to Little Yosemite Valley and that I would stay behind with these two. I gave them our GPS coordinates to pass to the rescue personnel. I also activated my SPOT GPS locator. I told the woman to gradually give her friend some water and I would attempt to signal the helicopter. It was still making circles making announcements but did not see us. Getting my signal mirror out, I started aiming at the chopper. One, two-three times. Wait…..one, two-three. After 10-15 minutes the pilot turned in our direction and descended. I immediately laid down on my back with my hands extending out – the international signal for distress-“need medical attention” The clearing was large enough for them to land. A rescue crewman jumped out and checked out the downed hiker. We helped carry him to the helicopter in a stretcher and there was enough room for all of us. Half Dome from the “other side”. Lifting off, I had a brief flashback from my time as a naval aircrewman going through survival training. Only this time, I was the one being rescued. Flying by Half Dome, you could see a crowd of people waiting to be rescued. We landed in a staging area near the Ahwahnee Hotel where the hiker was taken by ambulance to the medical center. We would later find out that he suffered from heat stroke but would recover. Now, concerned for my family, I tried to find out what they were doing to evacuate the people in Little Yosemite Valley. Within minutes, another helicopter landed and four people emerged. I asked one of them where they came from. They said that they were picked up in Little Yosemite Valley and that there were over 50 people left. I prayed again for my family’s safety and another chopper landed with four more people. You could see the smoke plumes from behind Half Dome as they went straight up to about 9-10,000 ft. and then blew in a westerly direction. The landing zone for the helicopters was cordoned off by the park rangers, so I dropped my pack and waited as close as possible to the boundary. Several more landed and finally by wife and brother emerged. Hugging them both, the first thing out of my brothers’ mouth was “Where can we get a hamburger?” Yep, that’s how it ends. 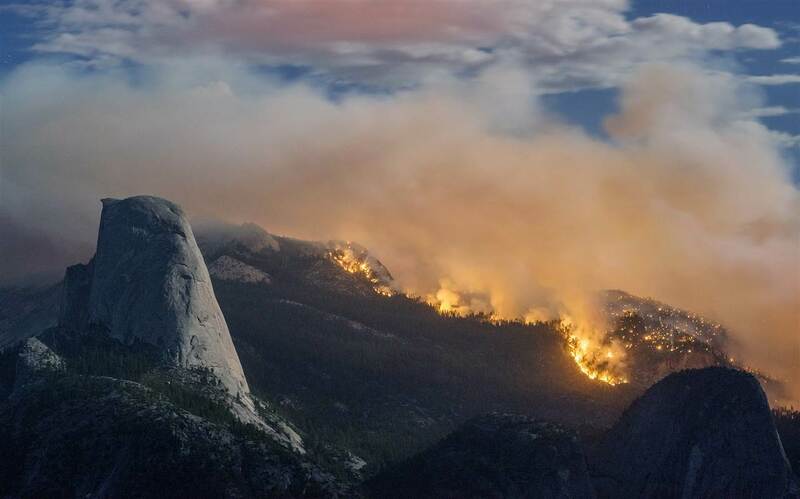 While this story was fiction, a wildfire caused by lightning did occur in Yosemite National Park east of Half Dome in September 2014. The “Meadow Fire” consumed almost 5,000 acres and took several weeks to contain. 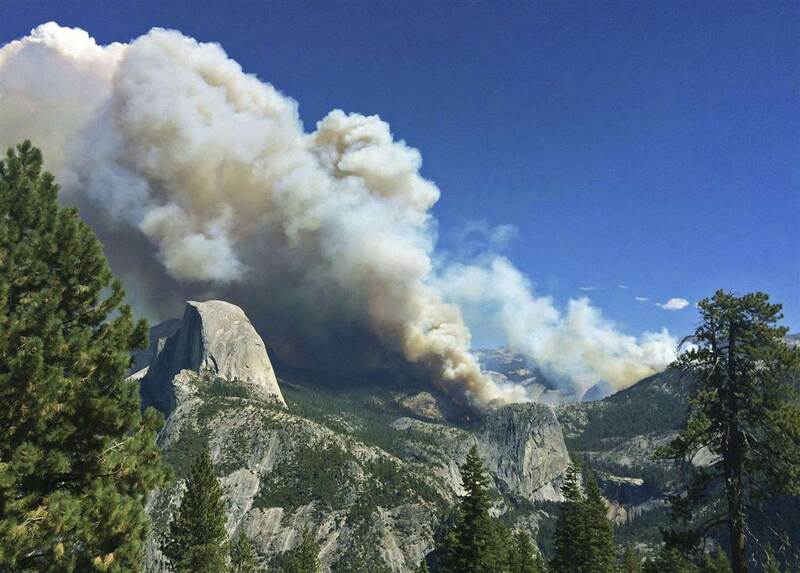 Over 100 hikers were evacuated from Half Dome and the area around Little Yosemite Valley. The National Park Service led an orderly evacuation. Fire is one of many hazards that one can encounter in the backcountry. Always let someone know where you will be hiking and discuss events like flash floods, lightning and fire. We were finishing up a section hike of the John Muir Trail in early September. The trip from Mammoth into Yosemite was filled with the most amazing views. In Devil’s Postpile Campground, it was nice to gather around the fire to talk about our upcoming adventure. 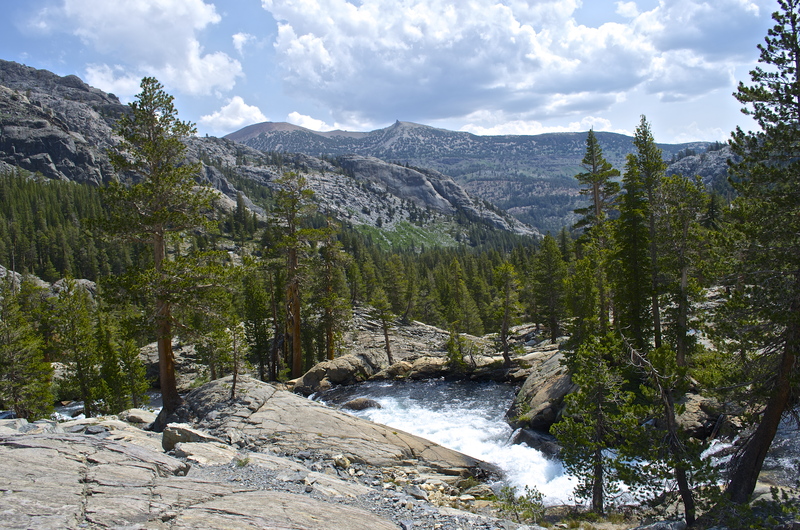 During our hike, we observed that most of the terrain around the JMT was pristine. There was an area near Devil’s Postpile that had recently burned. It was apparently caused by lightning. The weather was perfect as we skirted thunderstorms for the past couple of days. 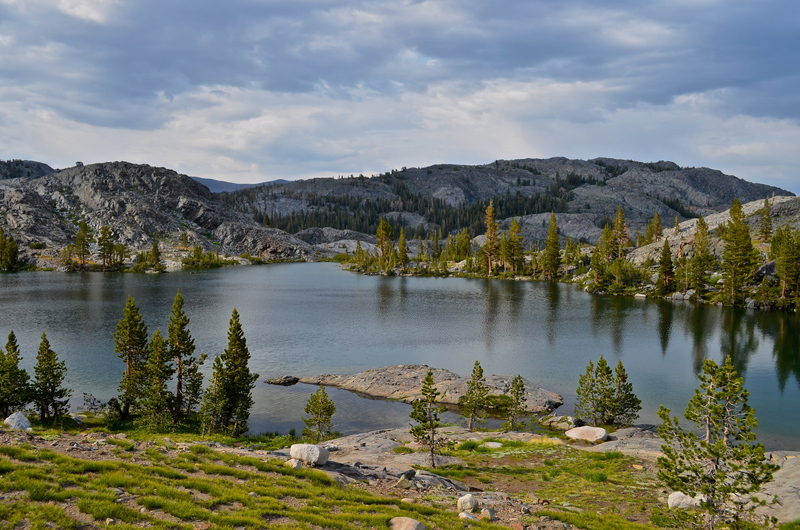 Late August or Early September is a good time to do backcountry in the Sierras. Much later and the chance of snow really increases. The mosquitoes are not as bad and stream crossings are usually a bit easier. We met some southbound hikers before Donohue Pass that mentioned how they were pummeled by a storm, hail and all. Noticed the first bit of snow at Donohue and made the transition from Ansel Adams Wilderness to Yosemite NP. The trek through Lyle Canyon was at a fast pace as the storm seemed to be on our heels. For most of the week, we went without a campfire since the USFS had a ban in place. We passed through Tuolumne Meadows and enjoyed some non-dehydrated food. Next was a glorious day spent near Lower Cathedral Lake where we made camp near the shore. What a magical place. The thunder continued to rumble around us through late afternoon, but it never rained. The next day we pressed on for 11-12 miles. 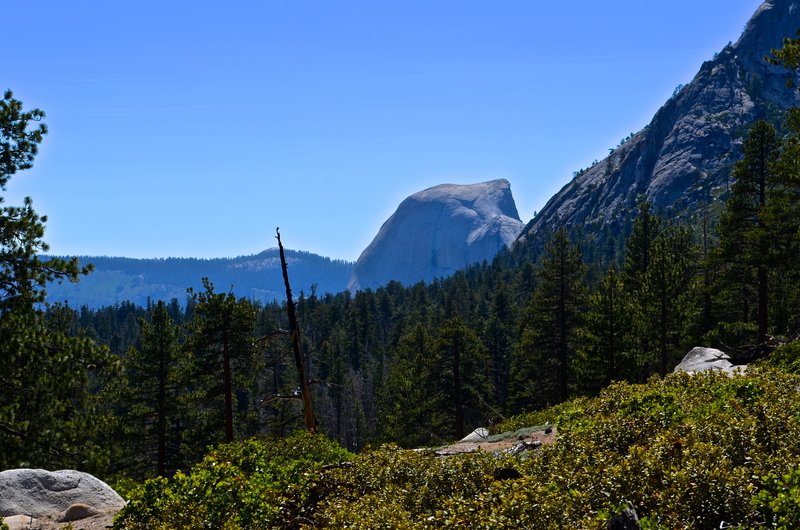 We were fortunate enough to nab a site with decent views of Half Dome which appeared a couple of miles away. 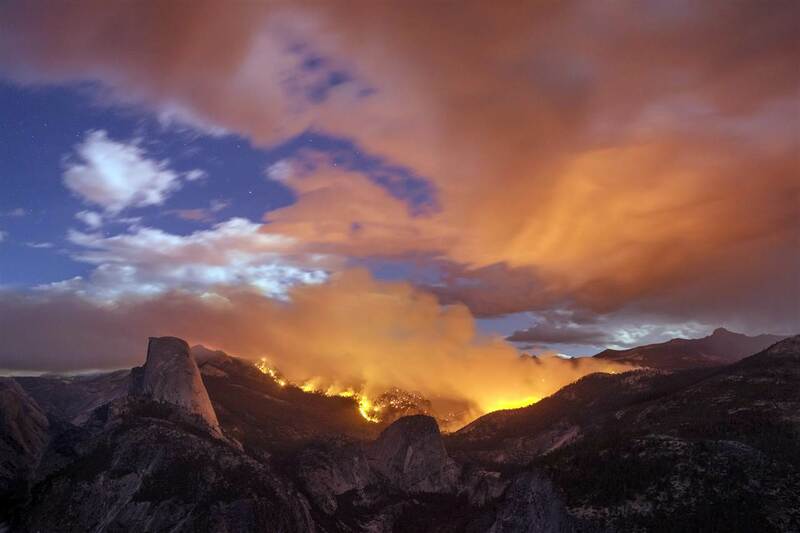 In Yosemite, below 9,000 ft. campfires were still allowed. We gathered up loose firewood and proceeded to make a nice fire. The site we picked already had a fire pit and we reinforced the edge with some additional rocks. Before dusk, we went down to the creek to filter some water. The water flow here was poor and the mosquitoes were swarming. I pumped my water filter faster than ever before while swatting those pesky critters. All week, we evaded them and wore long sleeves and our head-nets. Tonight, I was bitten more while filtering than the previous six nights combined. Oh well, we needed the water for dinner and some extra to put out the campfire. After dinner, we noticed the skies had clouded up a bit. We were spared from the rain one more night. I thought about a previous camping trip where the rain serenaded me to sleep. Next to a rushing stream, a light rain is the perfect sleep machine. Sometime during the night, we did hear thunder as well as see the lightning as it lit up our tents. It sounded like it was 10-15 miles away. Our site was in a good spot and not in a flash flood prone area. By dawn, the far away storm had subsided. We noticed the campers above us had packed up early. They were going to Half Dome. We ate a light breakfast, packed up and were on our way to finish our trip. Today would be approximately 7 miles as we would pass the dome, Little Yosemite Valley, Nevada and Vernal Falls. As we got back on the trail, we passed a small group heading back from a 3 day stay at one of the High Sierra Camps. They were chatting how “glamping” was the way to go. Glamping or glamour-camping is luxury camping. You stay in a yurt, or cabin and receive room service or have your meals prepared for you. Hmm, sounds nice after all. At this point, we started talking about real food again. While it had only been a few days since the cheeseburger in Tuolumne Meadows, the idea of fast-food still sounded good. 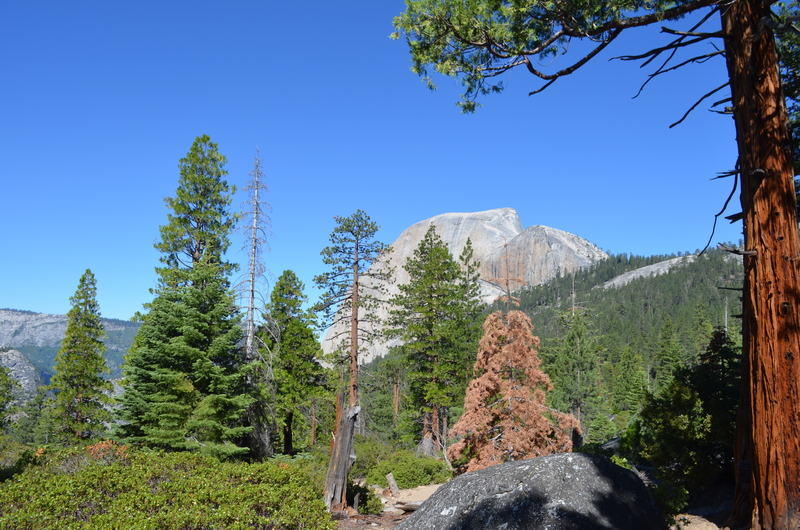 Eventually, we emerged from the canopy with Half Dome to our west and Vogelsang Peak to our east. Suddenly, there was a thrashing sound to our left and a group of 4-5 deer bolted out of the forest in front of us. What the heck? Then we saw why they were running. A white billowing cloud covered half of the horizon to the east. Was it a cumulus cloud – or smoke? The three of us stopped to get a better look. Within a few minutes, it started snowing. Except this was not regular snow, it was ash. Now it hit us – forest fire! thelatebloomerhiker.com is a participant in the Amazon Services LLC Associates Program, an affiliate advertising program designed to provide a means for sites to earn advertising fees by advertising and linking to amazon.com.